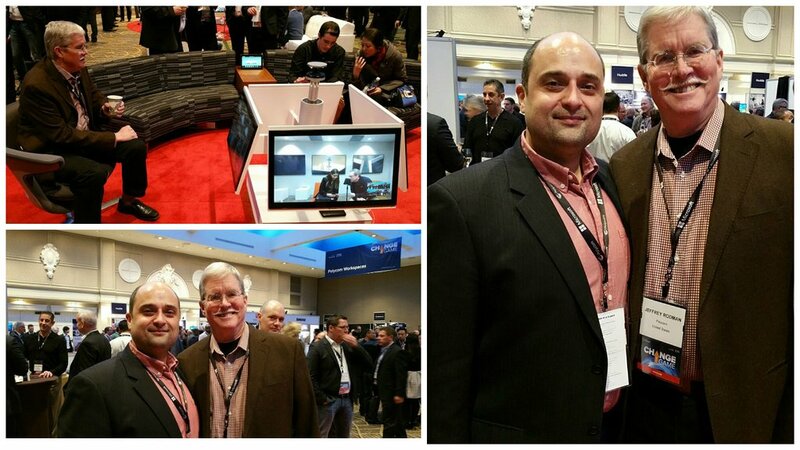 Last week, from January 12th to 15th, Polycom held their annual TEAM Polycom event in Nashville, Tennessee. 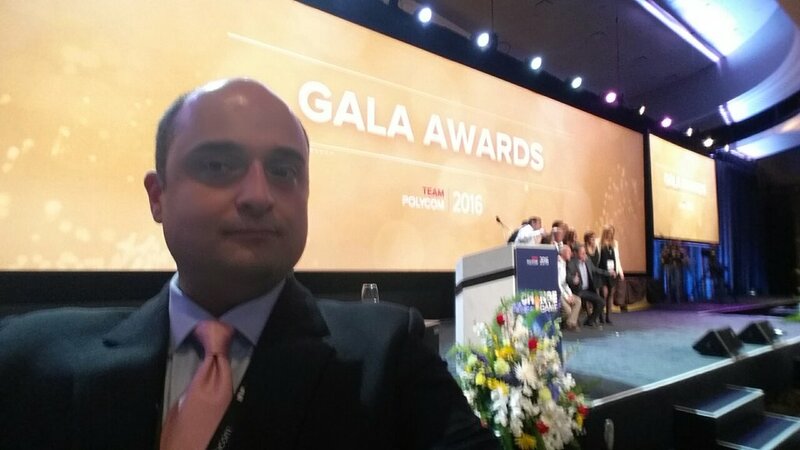 Thousands of professionals roamed the Gaylord Opryland resort, learning about how Polycom plans to “Change the Game” in the conferencing world in 2016 and I was delighted to be one of them. I also had a blast mingling with both partners and Polycom team members from all over the globe (Iran, China, Japan, and Australia, to name a few). The ability to connect with partners throughout the event sparked an underlying theme of comradery, excitement, and team-building. Historically, Polycom has hosted their sales and partner conferences separately, but this year they decided to try something different. This year the two conferences overlapped and it completely changed the atmosphere of the event in a positive way. While there were many incredible speakers at the event, the one who made the biggest impact on me was Scott McKain – the author of Create Distinction. McKain’s speech emphasized the importance of differentiating your business from your competitors. He discussed how just going one little step further than your competitors every day will eventually leave your competition in the dust. McKain also mentioned the absurdity of people having a favorite bottled water company. It’s an industry where every product is seemingly identical, but brands have made such a strong impact on consumers that they gain their loyalty. His words made me realize that the conferencing world works the same way. Emphasizing the importance of customer support and brand loyalty through creating a positive experience is what helps make us stand out. 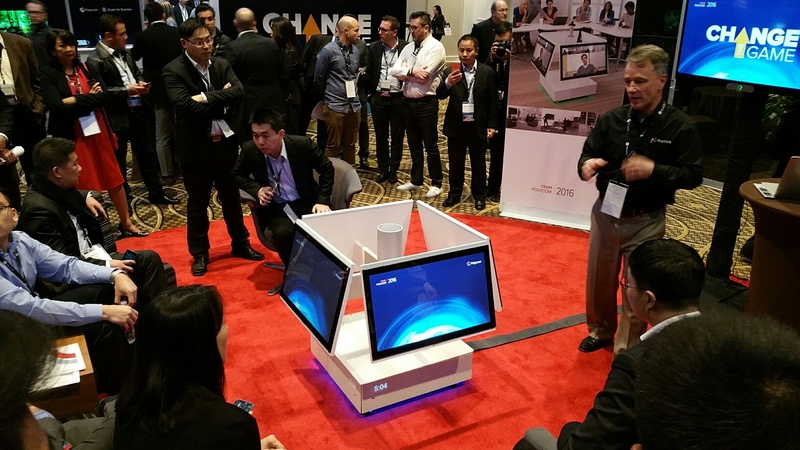 There were six RealPresence Centro units displayed at the Expo Hall of the event and people immediately gravitated toward them. When the Expo was first opened, the floor was practically empty, except for the huge crowds around the Centro. Everyone had high expectations for the solution and, wow, did it ever deliver. Human communication has always involved huddling in a circle, but video conferencing has never existed that way until the Centro. This solution brings everything to the circle in a highly interactive way. What makes it such a remarkable solution is the innovation with which it was made. Everything you need is within reach. This visual collaboration solution automatically zooms out and live edits as you move, or when there is a pause in conversation. The audio is directional and moves with people as they move about the room. The solution itself is even on casters, so you can roll it to wherever you need to have a meeting. To put it lightly, the RealPresence Centro is the biggest innovation in video conferencing since the conversion from ISDN to IP. Another popular item at the event was the RealPresence Trio, a modular smart hub with an intuitive touch screen, similar to that of an iPhone. Not only does it have improved, crystal clear sound, but it also offers more convenient features, such as a mute button on every edge of the device to avoid the dreaded sound of a device dragging across a boardroom table. The Trio also offers Bluetooth pairing, so you can easily pair your phone to the device on the go. It even has a USB port for charging your phone. Its built-in HD content sharing capabilities allow you to share visual content from your phone, tablet, or PC. Plus, the content sharing capabilities are simple to use, in or out of a phone call, in any huddle space. It also has a video add-on with support for a 1080p30 USB camera. 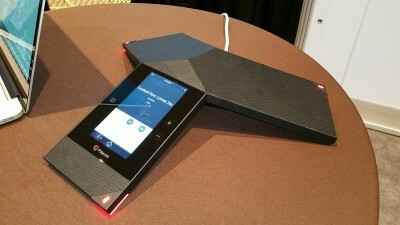 The Trio is a brilliant update by Polycom to an already outstanding device. It’s safe to say it’s changing the game in the huddle room and the audio conferencing space. The RealPresence Debut is an affordable huddle room video system that’s easy to set up and provisions quickly. Just simply drop it on your TV and enjoy its HD quality video and clear sound. This product is the perfect solution because it doesn’t take much technical expertise or time from an IT team to set up, plus the price is right. Polycom Labs features new technology and solutions that haven’t been released yet. One exciting example of innovation demonstrated to us at the event was “Pamela,” essentially the Siri of video systems. You can instruct it to “call Mom” and the system does it. It’s interactive and voice-automated. Another example of an upcoming innovation was content sharing on touch screens. This technology allowed you to load up multiple pieces of content and drag and drop them and stretch them with your fingers in the way that we’ve all become accustomed to working with content on displays such as iPads. I also got to see an upcoming innovation that customizes the experience for each user in a meeting. Essentially, we’re heading into a direction where the conference room will change for each user. The user would swipe an ID or security card and it would bring up his or her customized screen. Clearly, there’s a lot to look forward to in coming years and we’re going down the path of customization and ease-of-use. Polycom launched RealPresence Clariti during the TEAM Polycom event, which is a cloud-ready collaboration infrastructure software. 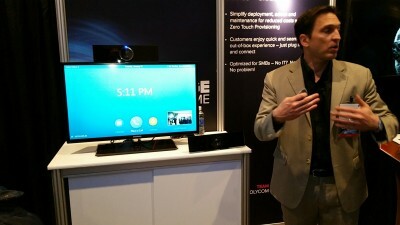 What Polycom is doing in the cloud is very exciting. Their cloud burst feature that they’re offering meets customers’ needs by providing extra capacity on demand. Polycom Sandbox is an incredible new option that will offer developers more support and an extension of collaboration into new workflows. RealPresence Clairiti gives people a new and simple way to buy virtualized private clouds and bridging, in a way that I think the market will understand, unlike some previous methods. I had the pleasure of meeting Jeffery Rodman, Co-Founder/Chief Evangelist at Polycom, which was a major highlight for me. What he did 25 years ago for this industry is what I hope to do in the next 25 years. He is constantly innovating and improving the way people interact with technology. I am incredibly impressed by his accomplishments and glad we had the opportunity to have a conversation. Overall, the TEAM Polycom event was a huge success. People who attended the event came out of it feeling excited for the future and excited about the potential of these new products. Plus, it gave sales teams and partners an opportunity to strengthen their bonds and make a real, human connection. And, last but not least, Nashville was the best and it was a total joy to experience some homegrown Southern politeness. I look forward to next year’s event and all the innovation that’s coming our way in 2016! Peter Bean joined Pragmatic Conferencing in 2010 with the task of growing the companies Webcasting and Video Conferencing business. Within 6 months of joining the company, Peter's role expanded to include Web Conferencing and all rich media collaborative solutions. Peter is a conferencing industry veteran with 10 years of industry experience. He has held nearly every role within the conferencing industry throughout his career. His knowledge of collaboration systems and applications (and how they work together) as well as his reputation as a subject matter expert is well known in the Canadian conferencing industry. He also has a strong background in online events and webinar production from his time as a Webinar Producer. In the past, Peter has held roles as a Sales Manager at Enunciate Conferencing and PGi.